PE0234. JOY-LAND (Herman Dareweski, de Courville & Pink), w.London Hippodrome Ensemble; Shirley Kellogg (Mrs Albert de Courville), Harry Tate, Bertram Wallis, George Carvey, etc. ; Murray Johnson & Aimée Maxwell: Excerpts from the HMV Records. (England) Palaeophonics 125, recorded 1915, Complete, as Recorded, w.Elaborate ‘The Play’ 20pp. Brochure replete w.photos from the London production & facsimile of original brochure. 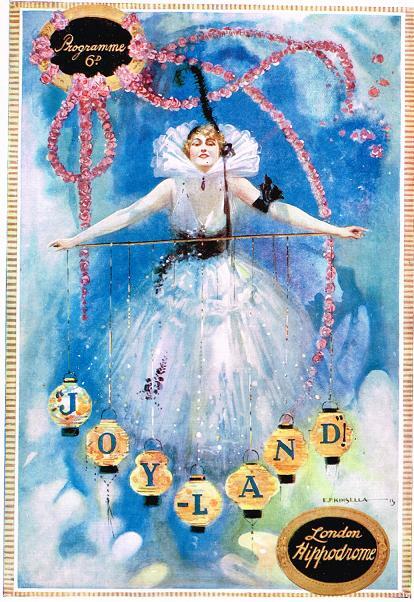 JOY-LAND was produced at the London Hippodrome, on 23 Dec., 1915 and ran for 409 performances. Included is an elaborate 6pp. Columbia Records brochure featuring numerous photos of the production. “Herman Darewski was a British composer and conductor of light music. His most successful work was perhaps THE BETTER 'OLE, which ran for over 800 performances in its original London production in 1917. Some of his songs became very successful in musical revues. Darewski was born in Minsk, then part of the Russian empire, where his father Eduard Darewski, a Polish singing professor, was working. The family moved to London where Herman worked, for the first 15 years of the 20th century, with the London music publishers Francis, Day and Hunter as one of their composing staff as a composer of light songs, some of which were written for the new theatre form, revue. After the First World War, Darewski had a long career as a conductor of light music, both in London and at English coastal resorts. In 1914 he visited Australia with his wife, the musical comedy actress Madge Temple, who was playing leading roles there. After his return to Britain during the First World War, Darewski combined administrative work for charities and prolific composition. He was one of the first British composers to compose for the new theatrical form, revue, writing, among others, BUSINESS AS USUAL and PUSH AND GO for Albert de Courville, and THE BETTER 'OLE and CARMINETTA for Charles B. Cochran. 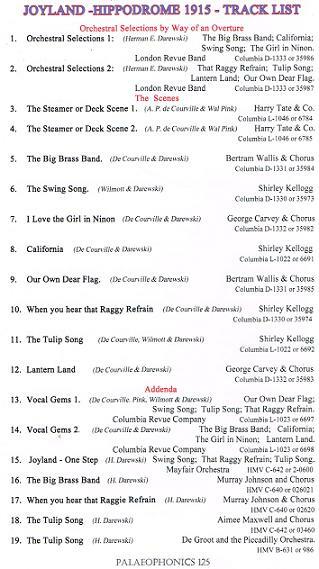 Among Darewski's songs are ‘Sister Susie's Sewing Shirts for Soldiers’, ‘The Big Brass Band’, ‘K-K-K-Katy’ and ‘Ours is a Nice 'Ouse Ours Is’. He also wrote songs for the London production of PHI-PHI. After the war, a brief and unsuccessful attempt to strike out on his own as a publisher was followed by a new career as the conductor of light music orchestras. The Times wrote, ‘When British light orchestras were being ousted wholesale by foreign competition, he gave them new life, and was the precursor of men like Mr. Jack Hylton and Mr. Debroy Somers’. Between 1924 and 1937 he was in charge of the music at the resorts of Bridlington and Blackpool, with an interval in 1930 to 1932 when he conducted at one of London's largest cinemas. Darewski died in London at the age of 67. In February 1940 Tate suffered a stroke and died, aged 67, shortly after; while in bed between the two events he told reporters that he had been injured during an air raid, and because they failed to realise that he was joking this is often given as the cause of his death. For a time, his son Ronnie continued the act as Harry Tate junior. Bertram Wallis was an English actor and singer known for his performances in plays, musical comedies and operettas in the early 20th century, first as leading men and then in character roles. He also later appeared in several film roles. A huge man who stood almost 7 feet tall, he won the Westmorland Scholarship to study voice at the Royal Academy of Music, where he won the Parepa-Rosa gold medal and the Evill Prize. After his studies, his first role was Amiens in George Alexander's production of AS YOU LIKE IT in 1896. Edward German composed the music for the production, and Wallis' performance of his songs won praise: ‘Mr. Bertram Wallis as Amiens sings his solos so well as to quite justify Jacques's remark, 'More, I pr'y thee, more'”. Soon afterwards, he played in MUCH ADO ABOUT NOTHING, his last production of a Shakespeare play.